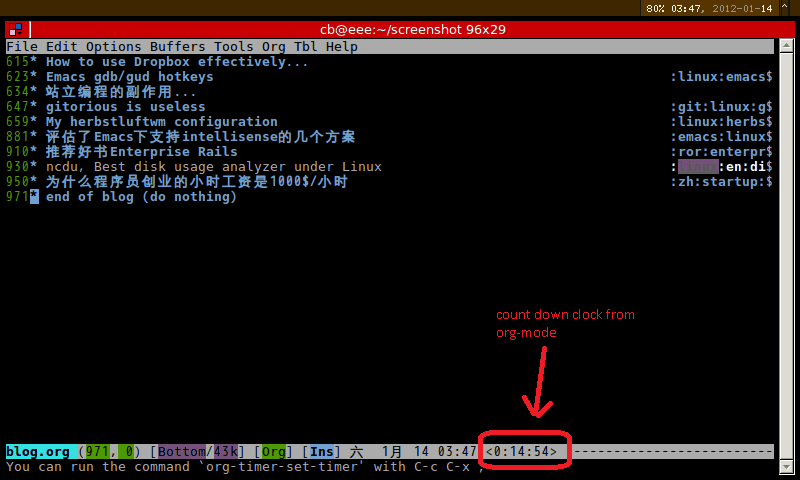 In Emacs, status bar at the bottom of the buffer is called the mode-line. It contains too much information for me because my screen is tiny (I use the netbook Eee PC 701 whose LCD resolution is 800x480). For example, org-mode will append some information at the mode-line which is beyond my tiny screen. See customizing the mode-line for the solution to clean up the mode-line. But there is one problem. The variable global-mode-string is missing in mode-line. So my favorite org-mode trick M-x org-timer-set-timer won't work. Here is my fixed version.